Falna is a town in Pali District, 75 km from the district headquarters of Pali and 7 km from Bali. It is the nearest railhead to famous Ranakpur temples. The temples are 35 km from Falna. In Falna itself the Jain Golden Temple is a visitor attraction. 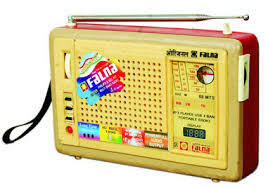 Falna is divided into two parts - Falna station and Falna village. Falna village is about five kilometers from Falna station. It is a small village having beautiful sceneries. Falna station has a large industrial area. It is famous for its umbrella industry and radios also. Around 1881, Falna was initially set up as a railway station in Rajputana State Railway later in Bombay, Baroda and Central India Railway. Falna station is the second most earning station after Ajmer in the Ajmer Railway division. It is also known as little Mumbai due to too many little industries and also for its economy. 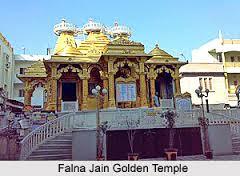 Falna Jain Golden Temple is a temple built at Falna near the famous Jain temple Ranakpur. It is the first Jain golden temple that has been built in the country by the Jain community of Falna in Rajasthan. The specialty of the temple is that about 100 kg. of gold was donated by the people of the Jain community in the local region for the adoration of temple dome and idol. It is well known and popular among tourists. The temple was built with 100 kg of gold donated by the Jain temple community of Falna. The entire temple structure is coated with this gold. The main idol is made of black granite. Shri Bhairon Singh Shekhawat, Vice-President of India inaugurated the temple and joined the installation ceremonies along with other celebrities. It is owned by the Jain Shwetambar Sangh of Khudala. It is a major attraction for Pilgrims. The temple belongs to Shri Shankeshwar Parshwanath Bhagwan. "Kanch Mandir" located below the main temple is also good where the walls are covered with small sizes of mirrors. Though it is small, but it is a beautiful place. Another temple, Nimbo Ka Nath Mahadev Temple, situated on the road to Sanderao, is worth a visit. There are many other places of interest (mostly temples) which includes Khareshwarji, Ambaji Mandir, Shitla Mata Mandir, Chandrabholeshwar Mahadev Mandir, Shani Maharaj Mandir Hanuman Mandir, Nilkanth Mahadev Mandir, Pashupatinath Shiv Mandir, Baba Ramdev Mandir etc. Most of us do not appreciate the value of time. We treat it as if we possessed an inexhaustible store of it. We keep chatting on the phone; watch cartoon movie on TV; play computer games or just sleep; without realizing how much time we have wasted. First we waste time and then; because we do not have sufficient time left; rush through the day's work in a shoddy manner. Thus we end up feeling stupid. There are two things about time that we should never forget. First: we all have a limited amount of time. Secondly: time once gone is gone forever. Nothing can bring it back; not even one second of it. We should learn the value of time from those who have been successful in life. They too had the same 24 - hour day that we have. But they were able to achieve so much because they made the best possible use of their time. Let us seek inspiration from and use our time wisely. Monday, 25th July: An activity was organized for the students of Pre- Primary. Theme of the activity was ‘Monsoon’. 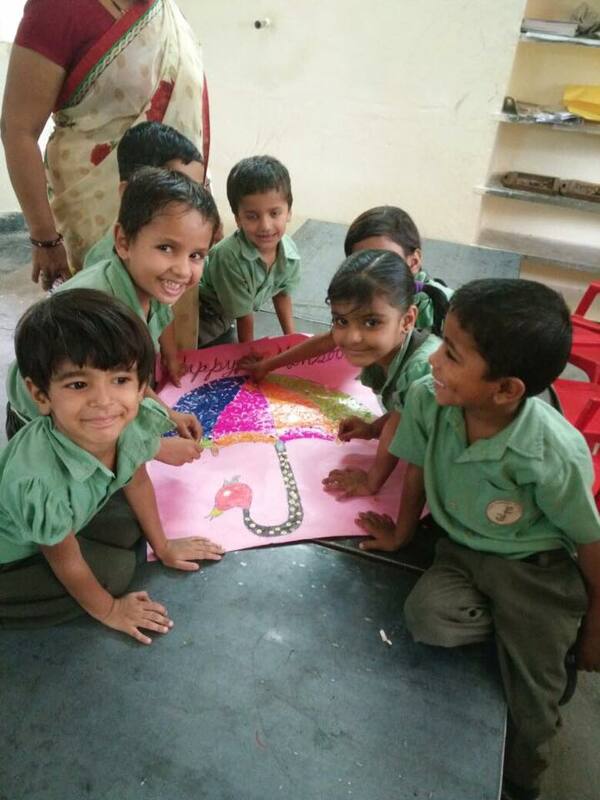 Students excitedly made beautiful charts with pictures of umbrellas and coloured them. They were happy to do this activity. Friday, 26th July: Bhel- Making Activity was organized for students of Pre-Primary section. They made bhel with the help of their teachers and happily ate the delicious bhel. Monday, 25th July: FA II began for the students of Class VI- X. They had written test in all subjects. Tuesday 26th July: Special Assembly was held on Kargil Vijay Diwas. Mrs. Kusum Sharma made us aware of the day. She told us that this war was fought for 60 days approximately 2 months and 525 soldiers from India were killed and 1000’s of soldier died in the war. At last India won this war so it is celebrated as the Kargil Vijay Diwas. Thursday, 28th July: Tamara Kribs from US who runs a Travel Agency visited school. She took a round of school. Then during break time she was introduced to staff, she interacted with them. Tamara visited Class X, XI & XII. She gave a talk about various Internship programs for students. After that students were filled with a lot of information for their future career. Friday, 29th July: FA II ended that day. Students were relieved and happy after five days test. School is happy to inform that they have taken Three Phase Connection. Transformer has been installed. All are happy that they will be relieved from the scorching heat and IT work will be carried out smoothly. Heavy showers from 28th July to 30th July at last granted students’ wish. The Principal declared this term’s first rainy holiday on 30th July, Saturday. The whole surrounding area was filled with water and the school became an island. Staff attended their PDP Session on Monday and Tuesday. They were given PDP Assessment Score Card in which they had to fill in their learning and workshops they attended. After that they got busy in discussing stories and classroom situations according to chapters allotted to them.